The crisis ridden BJP-run Jorhat Municipal Board (JMB) on Monday removed its beleaguered chairman Jayanta Borkakoty through a vote of no confidence. Nine BJP ward commissioners and all seven Congress Commissioners, passed a vote of no- confidence against Borkakoty. A JMB source said that the no-trust vote was passed in a special general meeting of the JMB convened by the Vice-Chairman Paban Bordoloi to take a decision on whether Borkakoty should continue as chairman. Borkakoty in the first week of December last year had sought one month’s leave from the Board to prove his “innocence” regarding allegations of having an illicit relationship with a widow in his ward which was widely reported in the media. Borkakoty had denied the allegations but faced opposition from members of his own party apart from the Congress. Things had come to a head on January 25 when in a letter submitted to the then Jorhat Deputy Commissioner Narayan Konwar, 16 ward commissioners expressed dissatisfaction at the performance of Borkakoty and by a no-confidence motion against him in the Board meeting held that day sought his removal. The letter urged the Deputy Commissioner to take action as per provisions of the laws that govern the civic bodies of the State and remove Borkakoty from the post at the earliest. A source said that Konwar had sought legal opinion on the matter from the Jorhat district Government Pleader Simanta Borthakur. Thereafter, Konwar had relinquished charge on January 29 and left for Dispur for a new post. Simanta Borthakur’ on February 6 gave his opinion, in a letter to the JMB Executive Officer Bipul Kumar Das, who is also the Jorhat (Sadar) Sub-divisional Officer. Borthakur, in his letter, stated that the no-confidence motion passed by the JMB against Borkakoty by a total 16 out of 19 ward commissioners did not bear any legal value as it was not passed as per procedure and provisions under the Assam Municipal Act 1956 and that this did not amount to a legal notice. 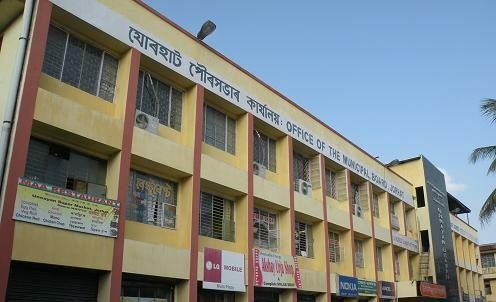 The source said in view of the opinion presented by the Government Pleader to Das on the matter, the JMB Executive Officer directed the 16 ward commissioners seeking Borkakoty’s ouster, to convene a special general meeting of the JMB to vote on the issue, which was held yesterday in presence of Das. Das who was present in the special meeting convened by the JMB Vice-Chairman Paban Bordoloi tobserved the proceedings as per the provisions of the law. The JMB Executive Officer said that all 16 ward-commissioners present in the meeting voted against Borkakoty. Das said as per the law Borkakoty will cease to be the Chairman as the no-trust vote was passed as per provisions of the Act. He said a new special meeting of the Board will have to be convened again by the JMB Vice-Chairman to elect a new chairman and till then he (Vice-Chairman) will officiate as the Chairman of JMB. The JMB run by BJP since April 1, 2015, has been marred by infighting leading to replacement in the post of Chairman in September 2017. Then JMB chairperson Aruna Dutta had quit the post on August 3, 2017, after she reportedly faced opposition from a section of her own party ward commissioners. The BJP enjoys a majority in the JMB with 12 out of the total 19 ward commissioners belonging to the BJP and rest seven commissioners from the Congress.